Heat oven to 350°F (180°C). Place 12 paper baking cups in regular-size muffin/cupcake pan. Beat cupcake mix, water, oil and egg in medium bowl on low speed 30 seconds, then on medium speed 2 minutes (or beat with whisk until well blended), scraping bowl occasionally. Divide batter evenly between the 12 cups, filling each about 1/2 full. Bake for 15 to 17 minutes or until a toothpick inserted in the centre comes out clean. Cool 5 minutes; carefully remove from pan and allow to cool completely before frosting. Frost by first kneading frosting packets about 10 seconds. 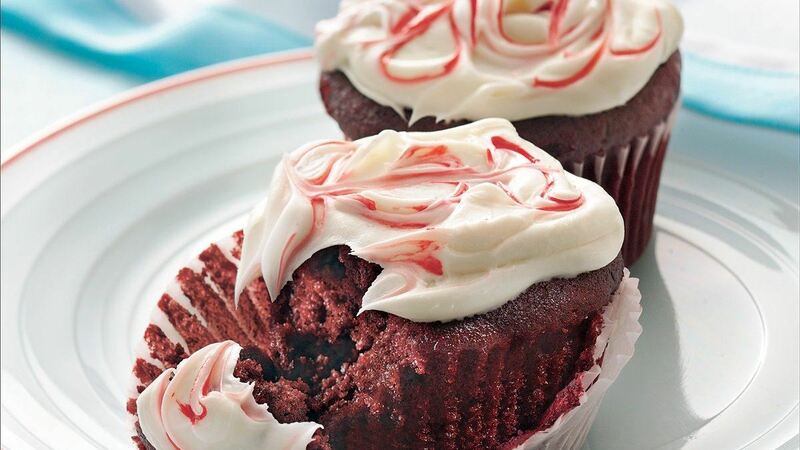 Cut off one corner of each packet; squeeze equal amount of frosting on top of each cupcake. To make red food colour paint, mix 1 tsp (5 mL) water and 3 to 4 drops of red food colour. Using a fine-tip brush, paint cupcakes with red food colour paint, swirling paint to create design.